Small and medium businesses have benefited from the American Express business card suite for years. The Gold Rewards card is one example of how well the brand targets smaller businesses. While it’s a great solution, there are a few considerations to keep in mind before you apply. As mentioned, there are many benefits that define this business credit card. Perhaps it’s the unlimited rewards potential. Seriously, no limits and no expiration dates mean the sky’s the limit. Depending on how you use the AMEX card, it could easily add up to some really nice additions to your business. Shift $5,000 of your business purchases to your credit card and you instantly add an additional 25,000 bonus points each year. Use them for cash back, merchandise, travel or even gift cards. There is no pre-set spending limit, however, your purchases at any given time are based on your current credit record and account history. You’ll also earn other discounts related to your business and the first time you use the American Express card, you’ll notice 25,000 bonus points applied to your account. While many business card dynamics require a lot of assets and exceptional credit ratings, this card is generally satisfied with a “good” credit rating, so it could mean an open door to an otherwise closed avenue for some business owners. Also, and this is a big benefit, business owners can order additional credit cards and place spending limits on each. This is a great option and ensures you don’t have to worry about a delivery being made with your office manager having no way to pay the invoice. The online account management is exceptional. You and anyone else you authorize can quickly gain access to your expense management reports and the network is compatible with many accounting software programs that are popular. It really is a perfect solution in terms of keeping a realistic view on your spending. 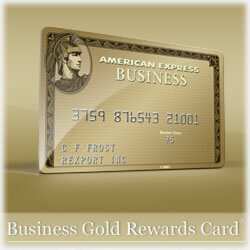 A card with this many benefits has to have a few considerations, and this business gold card does. First, you must be able to pay the balance in full each month. This isn’t a problem for many companies, but small businesses might find that a bit constricting. There is an annual fee of $125, though your first year is waived. And too, because there is no pre set spending limit, there exists the possibility of not being approved for any given purchase. While for most businesses, regardless of their size, these considerations aren’t deal breakers, for some small businesses, it could very easily serve as more of a liability than an asset, so consider the guidelines carefully. Many business owners like the generous rewards programs and flexibility American Express offers, but they aren’t necessarily drawn to the fact of having to pay the balance in full each month. For some, they say it limits their spending power. American Express listened and was the very reason the Blue line was introduced. The Blue Cash Everyday from American Express meets your demands if it’s an option to pay over time you’re interested in. There’s also no annual fee and AMEX is extending an introductory 0% APR for new applicants. Of course, with this traditional credit card, there are APR fees that you’ll need to factor into your business budget. It too offers a rewards program, including up to 5% cash back on qualifying purchases. It too offers an instant decision process, though your business credit rating will need to be a bit higher than its business Gold Rewards counterpart. Regardless of which card you ultimately choose, you and your purchases are protected by the American Express brand. That’s a powerful sense and with more credit card companies competing for our business these days, it just might be the perks will continue to improve as well as the complimentary services any given network provides its customers.